After our first five classes, studying historians' approaches to the frontier, this next segment of class examines pop-culture approaches to the frontier. Yet the sections of class aren't easily segregated. All along, actually, we've been examining representations of the frontier. A history textbook is one representation and Disney's Frontierland is another representation. The difference is that your history textbook aspired to depend on facts, while Disney promotes fictive myths. What fascinates me is how much the myths affect the history and vice versa. Myths draw power by making claims to authentic historic truth -- and myths also affect what historic stories we tell. As today's reading from Hine and Faragher explains, to anthropologists, myths mean "the body of tales, fables, and fantasies that help a people make sense of their history." We need some way to make sense of history, otherwise historians would just accumulate random facts instead of stories. Yet we need to also be alert, as historians, to avoid falling into cliched myths. 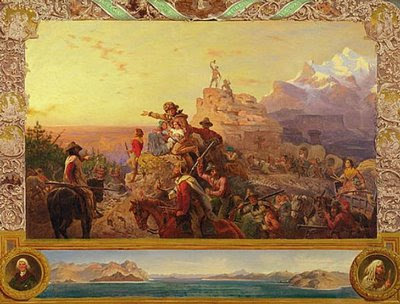 Today's reading covers some ground we have already considered in this blog (especially in day one), revisiting Leatherstocking, Bierstadt, Buffalo Bill, and others who gave cultural context to Turner's frontier thesis. As your reading points out, images like Emmanuel Leutze's "Westward the Course of Empire Takes its Way" are full of "stereotypes: frontiersmen shouldering their rifles... a stoic pioneer bride...a buckskinned Boone-like frontier farmer, joyously indicating the destination [in an] allegorical visualization of expansionist plans for the postwar west." You know these stereotypes because you yourself have seen them both in western movies and typical textbooks. You should know by now, too, how much is left out: the people who already existed in the land to which these pioneers are heading, the borderlands mixing of races and blending of gender roles, the government subsidies and corporate entanglements that enabled this settlement, the environmental impact of extractive industries of settlement, the many complexities of conquest. The myth of Leutze, Leatherstocking, Crockett, Buffalo Bill, and Turner isn't exactly accurate. Yet it is powerful and that power is fascinating. The heroes of western tales tend to be working-class men, close to nature, who pave the way for other less-natural, less-admirable, more "civilized" men. This myth actually suggests a criticism of civilization, even while it also celebrates western "Progress." 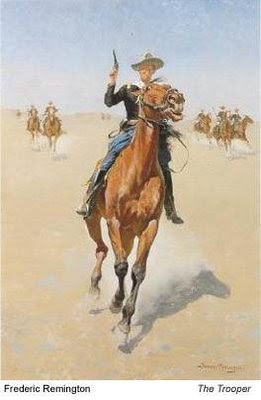 Artist Frederic Remington painted this image, while Owen Wister wrote about it, Teddy Roosevelt tried to live it, and Buffalo Bill especially made money from it. Even some Indians made money from it, performing with Buffalo Bill's Wild West Show. 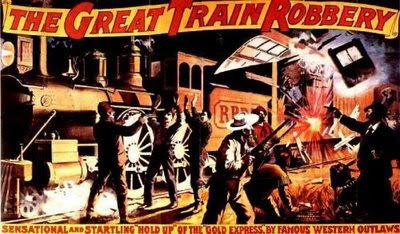 Versions of this myth filled dime novels, comic books, and the first movie, whose poster is below. This myth was questioned in the 1930s, but rekindled in the 1950s, with new layers. That's the subject of your second reading, Michael Steiner's article about Disney's "Frontierland," in which Steiner considers the power of the image that Disney promotes. It is a myth that is still being debated, as you may have noticed in the recent revival of debate over the team name Redskins. One way to think about this issue of pop-cultural frontier memories is to consider the 2014 video below. The National Congress of American Indians produced this video, "Proud to Be," in order to communicate all of the names that America's indigenous peoples choose to be called. The Yocha Dehe Wintun Nation paid for running this video as an advertisement during the NBA Finals, 2014, but just in case you did not see it on television, it is well worth watching now.